NASA's New Horizons spacecraft launches into space on a mission to the planet Pluto and beyond on Jan. 19, 2006. It took three attempts is as many days, but NASA's New Horizons spacecraft has successfully launched on its nine-year mission to the planet Pluto. 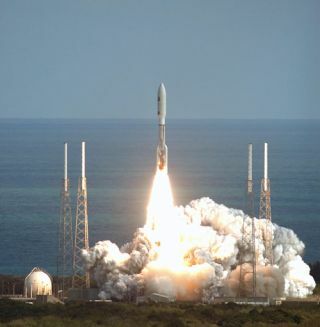 At 2:00 p.m. EST (1900 GMT) on Jan. 19, 2006, the New Horizons probe launched into space atop a Lockheed Martin-built Atlas 5 rocket, which flung the spacecraft 36,350 miles per hour (58,338 kilometers per hour) on a mission to the outer edges of our solar system. Poor weather, including winds and severe storms, prevented two earlier launch attempts earlier this week, but the third time proved to be a charm for New Horizons. NewHorizons principal investigator Alan Sternsaid that the ashes of the U.S. astronomer who discoveredPluto are accompanying NASA's mission to the distant planet. "Iwant to point out what a great honor it is to have Clyde's window [and family]here with us," Stern said of Patsy Tombaugh, whose husband ClydeTombaugh discovered Pluto in 1930 using the Lowell Observatory in FlagstaffArizona. "Some of Clyde's ashes are on the way to Pluto today." Tombaughdied on Jan. 17, 1997, Stern has said. GlenFountain, New Horizons project manager at Johns Hopkins University's AppliedPhysics Laboratory (APL), said plans are in place for two maneuvers - one 10days after launch and the second 20 days after liftoff - to refine NewHorizons' trajectory. Missionmanagers will begin planning for the Jupiter encounter in the fall, Fountainsaid. Thisconcludes SPACE.com's livecoverage of NASA's New Horizons launch. A wrap up story of today's space shotis available here. NASA'spost-launch press conference for its NewHorizons mission to Pluto is underway. "TheUnited States has a spacecraft on its way to Pluto, the Kuiper Belt and on tothe stars," said New Horizons principal investigator Alan Stern during theconference. "I have July 14, 2015 emblazoned on my calendar." NewHorizons will spend more than nine years flying toward Pluto and is expected tofly past Jupiter early next year. Groundstations received the first signals from the spacecraft at about 2:50 p.m. EST(1950 GMT), with all telemetry indicating good health, mission managers said.The probe's radioisotope thermoelectric generator (RTG), which converts heatfrom decaying plutonium dioxide into power, is generating about 180 watts andwill build up to 240 watts soon, they added. NASA willhold a press conference in about one hour to discuss the successful launch ofits NewHorizons probe bound for the planet Pluto and beyond. "Thevehicle looks to be right where it needs to be," NASA launch manager OmarBaez, said after the launch. "It was Mother Nature that was holding usback earlier, but we got through it." Today'slaunch marked the third attempt by NASA to loft New Horizons toward Pluto. High windspeeds at the probe's launch pad at Complex 41 of the Cape Canaveral Air ForceStation in Florida forced launch officials to calloff a space shot just minutes before liftoff on Tuesday. Nature revealedits ugly side again on Wednesday, when severe storms in Maryland preventeda Florida launch when they knocked out power at New Horizons' mission controlcenter at Johns Hopkins University's Applied Physics Laboratory. The laboratoryis managing the mission for NASA. About thesize of a grand piano, New Horizons is the first spacecraft ever destined tovisit the planet Pluto. The probe should fly past the Moon at about 11:00 p.m.EST (0800 Jan. 20 GMT) before heading toward a Jupiter flyby in early 2007. Check backhere for live coverage of NASA's post-launch press conference. A wrap up storyof today's launch is available here. NASA's NewHorizons spacecraft has successfully separated from its third stage boosterand begun the nine-year trek to the planet Pluto. Flying at aspeed of about 36,000 miles per hour, New Horizons is NASA's fastest missionlaunched to date. The probe should pass the Moon's orbit in about nine hoursand is destined to reach Jupiter early next year. If all goeswell, New Horizons should turn its seven instruments toward Pluto in July 2015. After twosuccessful burns, the Centaur upper stage for NASA's NewHorizons spacecraft has shut down. The stagesuccessfully separated from New Horizons' Star 48B third stage, which then firedits own engine to propel the spacecraft toward Pluto. NewHorizons is slated to separate from the Star 48B stage at about 2:47 p.m. EST(1947 GMT), according to its flight plan. The Centaurupper stage attached to NASA's NewHorizons spacecraft has successfully restarted its engine for the second oftwo planned burns. NASA's NewHorizons spacecraft has completed the first of two planned burns with itsCentaur upper stage and is in a coast phase for the next 16 minutes. Currentlyin a parking orbit, New Horizons will fire its Centaur stage engine once moreat about 2:32 p.m. EST (1932 GMT). NASA's NewHorizons spacecraft has reached space and begun the first of two plannedburns with its Centaur upper stage. This burn will last just over five minutes. Launch! NASA's NewHorizons spacecraft and its Atlas 5 rocket have launched from CapeCanaveral Air Force Station on the first mission to Pluto. Liftofftook place at 2:00 p.m. EST (1900 GMT). About oneminute and 33 seconds after liftoff, the booster's five strap-on rockets areexpected to separate, followed by jettison of the protective fairing shroudingNew Horizons about three minutes and 23 seconds into the flight. It should takethe Atlas 5-New Horizons combo about four minutes to reach space and separatefrom its first stage. The firstof two planned burns of the Centaur upper stage is planned for four minutes and43 seconds after launch. Thecountdown is ticking away once more at T-4 minutes and counting for a 2:00 p.m.EST (1900 GMT) launch of NASA's New Horizons probe bound for the planet Pluto. The launchof NASA's New Horizons spacecraft is now set for 2:00 p.m. EST (1900 GMT),delayed almost one hour from the opening of its flight window earlier today. Thick cloudcover over the probe's Cape Canaveral Air Force Station launch site hascontinuously thwarted the launch of New Horizons and its Atlas 5 booster. Flightcontrollers have added an extra five minutes to the current countdown hold aslow cloud cover continues to delay the planned launch of NASA's Pluto-bound NewHorizons spacecraft. Theearliest the probe can launch atop its Atlas 5 booster is 1:55 p.m. EST (1855)GMT, though the target is not set in stone, NASA officials said. Today'slaunch window for New Horizons runs just about two hours, closing at 3:07 p.m.EST (2007 GMT). Cloud coverover the launch site for NASA's New Horizons Pluto probe appears to again be aproblem for today's planned space shot. An Atlas 5rocket was set to launch New Horizons spaceward at 1:40 p.m. EST (1840 GMT) ina space shot to be staged from Complex 41 at Cape Canaveral Air Force Stationin Cape Canaveral, Florida. A new launch time is expected shortly. "Justwhen we thought the weather had cleared we are now in the a 'No-Gostatus," NASA spokesperson Bruce Buckingham said. Today'slaunch window for New Horizons runs through 3:07 p.m. EST (2007 GMT). Low cloudscontinue to dog flight controllers for today's New Horizons launch. The cloudscould obscure launch camera views of the planned liftoff, NASA officials said. A newlaunch time has been set for 1:40 p.m. EST (1840 GMT). Today's launch windowstretches through 3:07 p.m. EST (2007 GMT). Flightcontrollers have set a new launch target of 1:30 p.m. EST (1830 GMT). Launchrange officials reported that they were 'No-Go' for today's on-time launch dueto the cloud ceiling above the New Horizons launch site. The launchis now set for 1:25 p.m. EST (1825 GMT), about 17 minutes later than initiallyplanned. Today's launch window runs until 3:07 p.m. EST (2007 GMT). "Wehave a cloud ceiling that is borderline," NASA spokesperson BruceBuckingham said. "The broken cloud deck is in violation [of launchrules]." Brokencloud cover over the launch pad for NASA's New Horizons spacecraft is the onlyissue facing flight controllers for today's planned space shot, weatherofficials said. New Horizonscan launch in scattered clouds, though not heavier broken clouds, NASAspokesperson Bruce Buckingham said. Currentprojections call for broken clouds over Launch Complex 41, where New Horizonsand its Atlas 5 booster stand poised for launch, at the opening of today'slaunch window at 1:08 p.m. EST (1808 GMT). Conditions should ease to scatteredclouds during the one-hour and 59-minute launch window, with only a 20 percentchance of violating launch rules, weather officials said. "Thereis a definite trend for the better, which could let us launch on-time at theopening of the window," Buckingham said. Today'slaunch window closes at 3:07 p.m. EST (2007 GMT). Thecountdown is paused at T-4 minutes for a planned 10-minute hold. Launchpreparations are on schedule for NASA's Pluto-bound NewHorizons probe. With lessthan 15 minutes remaining in the countdown, all systems appear go for today'slaunch at 1:08 p.m. EST (1808 GMT). A final weather briefing is expected atabout 12:50 p.m. EST (1750 GMT), as well as a planned 10-minute hold in thecountdown at T-minus 4 minutes, NASA officials said. UnlikeTuesday's launch attempt, high wind speeds have not been a problem so far intoday's lauch attempt. Fuelingoperations for NASA's NewHorizons mission to Pluto are now complete with less than 30 minutesremaining in the countdown for launch. Weatherconditions continue to be optimal for today's planned 1:08 p.m. EST (1808 GMT)launch. "Itlooks like we will have an on-time launch," NASA spokesperson BruceBuckingham said. An Atlas 5rocket is set to launch New Horizons, a seven-instrument probe about the sizeof a grand piano, spaceward at about 36,000 miles per hour, fast enough to passthe Moon's orbit in nine hours, NASA officials said, adding that the flight isthe fastest ever to fly for the space agency. Today'scountdown is the third launch attempt in as many days for New Horizons. Highwinds and a poweroutage at the mission's Maryland-based control center prevented earlierattempts. Less thanone hour remains in the countdown for NASA's NewHorizons spacecraft, which sits poised atop a Lockheed Martin-built Atlas 5booster at Launch Complex 41 of Cape Canaveral Air Force Station in Florida. Weatherconditions continue to look good for today's planned space shot, which isslated for 1:08 p.m. EST (1808 GMT). Fueling of the Atlas 5 rocket nearscompletion as flight officials prepare for the spaceflight. NewHorizons is NASA's first spacecraft bound to explore the planet Pluto, itsmoons and the distant Kuiper Belt objects beyond. The spacecraft's lauch windowextends through 3:07 p.m. EST (2007 GMT) today. Fueling isunderway of the Atlas 5 rocket set to launch NASA's NewHorizons Pluto probe from Cape Canaveral Air Force Station later today. The Centaurupper stage of New Horizon's 200-foot tall rocket has been filled with liquidoxygen needed for launch and its first stage booster is currently being fueledwith the supercold materal, NASA officials said. Liquid hydrogen is also beingpumped into the Centaur stage, they added. The rocketis on track for today's planned launch at 1:08 p.m. EST (1808 GMT). All systemsappear go for today's launch of NASA's NewHorizons spacecraft from Cape Canaveral Air Force Station in CapeCanaveral, Florida. Thecountdown clock is at T-2 hours and holding as flight controllers and engineersprepare the Pluto-bound spacecraft for launch. Liftoff of the probe and itsLockheed Martin-built Atlas 5 rocket is currently scheduled for 1:08 p.m. EST(1808 GMT), though the space shot has a launch window that extends until 3:06p.m. EST (2006). Today isthe third consecutive launch attempt for NASA's New Horizons spacecraft. Highwinds at the probe's Complex 41 launch site preventeda Tuesday launch attempt. A Wednesday launch attempt was foiled by a poweroutage in Maryland, where sever stormed knocked out electricity at the New Horizonsmission control center at Johns Hopkins University's Applied PhysicsLaboratory. Weatherofficials predict and 80 percent chance of favorable launch conditions today,NASA officials said. The potential for low-lying clouds are the only weather concern,they added. Currently,all systems and conditions are green for launch, with no technical issues understudy, NASA spokesperson Bruce Buckingham said. Launchofficials expected to begin fueling New Horizons' at about 11:00 a.m. EST (1600GMT). NASA's NewHorizons spacecraft is about the size of a grand piano and carries sevenprimary instruments to study Pluto, its moon system and Kuiper Belt object. Itis expected to arrive at Pluto in 2015, marking the first probe to the distantplanet. NASAofficials are hoping that the third time is a charm as they prepare to launchthe Pluto-bound NewHorizons probe from Cape Canaveral, Florida. The spacecraft'slaunch has been delayed twice in two consecutive days this week, once due to highwinds and again due to a poweroutage at the probe's mission operations center. NewHorizons is now set to launch on Jan. 19 at 1:08 p.m. EST (1808 GMT), though ithas a launch window that extends for one-hour and 59 minutes.